When am I Out of Status in USA? You are expected to obey the rules of the visa that you have used to enter USA to be designated with ‘Lawful status’. In addition, your i94 should have not expired. How can you get Out of Status in USA? You enter USA with H1B visa for employer A, and work on a specific job profile. If you keep working for employer A for the designated job and follow all other rules as laid out for H1B, you are considered in ‘Lawful status’. Similarly if you used H4 visa to enter USA, you are expected to NOT work unless you have acquired H4-EAD (work authorization). If you break any of your existing visa related rule before your status has not been explicitly changed (by you) using ‘Change-of -status’ application, you are considered ‘out-of-status’ for the period you broke the rule. If your i94 expires and you have still not filed for i94 extension or have not left the country, you are considered out-of-status’ while evaluating your ‘lawful status’. This comes into picture if your visa or i94 has expired. If you have already filed for a valid extension of your visa or i94 extension before any of them expired, and the decision is still pending with USCIS, you are considered ‘out-of-status‘ but in ‘period of authorized stay‘. This period of authorized stay continues until the USCIS issues a decision on the pending case. If the application or petition is approved with an extension or change of status, the period of ‘out-of-status‘ (from the date your visa expired to the date of USCIS decision is automatically converted to ‘Lawful status‘). Please note that you have to abide by the USCIS decision as and when it happens. There are other rules that need to be followed depending on your visa, in this waiting period. If those rules are not followed, your waiting period could be marked as ‘out-of-status’ even after they take a positive decision. How can you be in ‘Period of Authorized Stay’? Your H1B and i94 expires on Jan 31. You file H1B extension on Jan 1 the same year i.e. before it actually expires. The i94 and visa expires but USCIS has still not taken any decision. You are counted ‘out-of-status’ but in ‘period of authorized stay’ until USCIS takes a decision. Specifically, for H1B, this waiting period is maximum of 240 days starting after i94 expiry. Approves: Your ‘out-of-status’ (and subsequently ‘Period of authorized stay’) from Feb 1 to July 30 is automatically converted to ‘Lawful status‘. 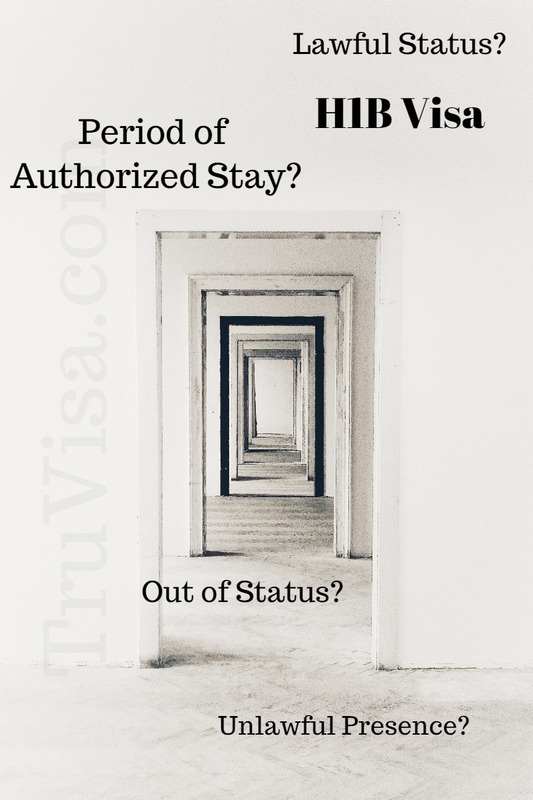 Rejects/denies: Your ‘out-of-status’ (and subsequently ‘Period of authorized stay’) from Feb 1 to July 30 is counted as ‘period of authorized stay only‘ as explained below. If you are neither in ‘lawful status’ nor in ‘period of authorized stay‘, then you are in ‘Unlawful presence‘. How can you be in ‘Unlawful Presence’? You did not file for your H1B extension before its expiry (i94 also expires on Jan 31) on Jan 31. Your ‘unlawful presence’ will start on Feb 1 if you do not leave the country on Feb 1 or earlier. You filed for H1b extension before Jan 31 and USCIS rejected your petition on July 30. Your stay in US from July 31 on-wards is counted as ‘Unlawful presence‘. Employer A filed H1 extension on 20 Dec 2018 . Got RFE on Jan 10 . replied RFE on Jan 28 . Converted case to premium on Feb 21 and got denial on Mar 6. Case updated on website, yet to receive denial notice . Meantime, Employer B filed H1 transfer on 28 Feb 2019. 1) Can I Join Employer B? 2) what are the options I have after denial . Your question is out of scope of this this article and hence we have added it to our forum here. You can ask follow up question on forum to get answer within 1-24 hours. Hi Can we file amendment after our I94 and H1 gets expired?? That is during 240 day limit after I9 got expired can we file for amendment for same employer?? Is it legal? You can file H1B Amendment after i94 expiry while your H1B extension is pending. But, your pending extension will become a bridge petition and will affect the result of Amendment. My h1b is expiring on may 30 2019 while my i94 is expiring on 22 March 2019. My company is filing extension but it is in process of internal evaluation. This was a helpful post but I did not understand in my case after 22 March I will be in unlawful status if my extension is not filed with uscis till then? Yes, you will be out-of-status if your extension is not filed before your i94 expiry i.e. Mar 22, 2019. You can keep working for new employer B until the H1B Transfer result is pending as per the 240 day rule. 240 days starts freshly again ? There is no 240 day limit for you but your extension petition is a bridge petition for you. Extention’s denial will affect the result of your transfer. still no 240 days limit ? I thought you are talking about H1B transfer to company B. That’s what you wrote that you transferred your H1B to company B. If you are still working on the payroll of Employer A but have only changed the client, then your employer A must have filed an H1B Amendment and not H1B transfer. What have you really filed? H1B transfer or H1B Amendment? 240 days rule will continue from company A or new 240 day rule starts with new company i.e Company B ? You can keep working after 240 too. But your pending extension application is a bridge petition and it will affect your transfer result now. Did you check with your attorney as to what is your status currently? As per my opinion, you are out of status at this time. Just double check with your attorney. My i-94 expired on 12/31. And before my expired I have been offered as FTE (currently as my client ) and they initiated my transfer Process. Later my current employer applied for extension. past week, my transfer got approved( with i-94 extension) for FTE even though current employer Extension is still In pending so new (FTE) company’s legal is saying that I have to travel to abroad and get it stamped before you can join FTE. Otherwise , current employer petition will be superseded with this FTE transfer petition. Is that true ? I thought both application is independent and if we get approval with i-94 extension then I don’t need to travel for stamping irrespective of order of applications…. If above states true then do I need to really worry about during VISA interview ? If you join new employer, your current employer will withdraw the existing pending extention petition and then you are safe as your transfer i94 will be the last one. Employers are obligated to withdraw petition if employee leaves them. But, if your current employer does not withdraw the pending petition and it eventually gets approved, then the i94 issued with that petition will supersede your current transfer i94. but if my current employer petition is approved , that being said if I have both valid I-797 then I can make choice , which one I need to get it stamped , correct ? since I I haven’t joined new company yet , will that be any problem with visa interview for new employer ? You can make a choice for stamping. This is what your new employer is also saying. You cannot use your new petition to get visa stamp. Do you know how long it takes for them to initiate withdraw petition ? Because sometime it happens that when my employer request for withdraws and meanwhile pending application can be approved. Can withdraw process can be taken part of premium or is it part of normal process ? Withdraw process is normal. Nobody would spend Premium processing fees for withdrawing an application either! Anil , thanks for details. My other pending petition approved yesterday before I can request for withdraw it. Now I have to go for stamping with FTE employer. Question: since I haven’t joined new employer , and they are asking to get it stamped before going with their company due to I-94 override scenario with my current employer , so when I fill out DS-160 what information I need to put as a present employer ? Will that be new information on which I’m gonnna get stamped or current employer that I’m working now ? If Answer is current employer then will that be any others details in DS 160 regarding to new employer that i have to fill it ? You should write the new employer’s information while filling DS-160 as that’s the one you are going to work with now after re-entering USA. Your information is really helpful !! So new company asked me to provide employemnet verification letter one week before I go for interview. If that would be case then that being said I’ll be their employee at that time , correct ? If so then Would not be a problem for me since at that time I should be really working for my current employer ? What do you prefer for joining date in my offer letter ? Does that would be before interview date or post interview date or it should be same as date they would issue employment verification date ? I think you are smart enough to decide your joining date yourself. I had visa intreview on day before yeterday at HYD consulate and visa officer gave me white sleep 221 g and he said like it will take additional 3-5 days on top of the regular processing. They did not ask me to submit any additional documents but they kept my passport. Any idea , how long it will take ? What are chances of getting approved ? Is that any way that I can expedite request from my employer ? Check form 221g admin processing time and what actually happens. My passport track status showing “issued” , what does that mean exactly ? Does that mean visa approved ? Yes, it means visa is issued. My H1B extension will be applied next week. My wife is on H4 and she got RFE on her H1B and RFE was replied in November 2018 and no status till now. My I94 and her H4 will be expiring on Apr 14 ,2019. Should H4 extension be applied along with my H1 extension. If her H1B gets approved after April. Should H4 be withdrawn and if withdrawn after Apr14 will hers be lawful status? Please help me if any suggestions. My suggestion is to file h4 extension to keep her in legal status after April 14, 2019. How has her H1B application been filed? H1B Consular processing or Change of Status? My F1 OPT grace period ends April 19, 2019. Will I be able to stay lawfully (in-status or period of authorized stay) if my employer files an I-129 H1B petition April 1, 2019? Or would I have to leave April 19 to prevent any chance of unlawful presence/out-of-status? You can stay in US if your employer files the F1 to H1B change of status application on April 1. I have covered the concept of F1 Cap Gap here. My H1B visa is expiring on June30-2019. My I94 is valid till Apr2-2019 (coz of my passport expiry) . I had my extension filed(by employer B) and approved till july-2021. I am working for employer B now. Can I legally stay in US after april2-2019.? You must have got a new i94 with your employer B’s H1B transfer approval. Does this new i94 attached to i797 form also show the validity date as Apr 2, 2019? If the new i94 also has short expiry to match your passport, then you should get a new passport and then get a new i94. You cannot stay in US if your i94 expires. I received my new petition in November. The i94 in the new petition is July-2021.. I went to India in Dec, came back to US in Jan. Now my latest I94 is April-2-2019. I have renewed my passport though (after coming to US). I guess I have to travel to Canada or Mexico or (home country) to update my I94. Let me know if my understanding is right . Also, I am from India. I need Candian Visa to update the I94 at Canada P.O.E right ? All the possible options to get a new i94 after passport renewal are given in the link I shared earlier. You will need Canadian visa to enter Canada POE. It is better to visit either Laredo, TX border of San Diego, CA border as you do not need Mexico visa. My daughter filed for Change of Status from H4 to F1 on 2-May-2018 and her H4 visa got expired on 12-Aug-2018, she is over 21 years. She got an RFE yesterday asking to maintain her status 30 days before the start date of next academic year, and suggested to file a separate I-539 though current one is still pending. She has been studying for last 2 years in her BS program on H4 and subsequently on pending COS from H4 to F1. Is there a way she can be in lawful status while she is waiting for RFE decision? I am not sure if anything else can be done except waiting for the F1 change of status decision. I was in L1B for employer A and my wife was working with Employer B on L2-EAD. I also had H1B approved a couple of years ago and I had to do a leap frog on Oct 1 to remain on L1. Meanwhile my wife’s petition got picked in this year H1b lottery. Now I have an offer and decided to join Employer C next week via H1B COS (which got approved today) . My wife has received an RFE for her H1B petition coincidentally today. What will be the status of my wife next week when my H1B becomes active. We did not apply H4 COS for her in the assumption that her H1b will be approved. But now, she has to resign from Employer B as she no longer is in L2 EAD and her H1B petition will not be processed by her employer as she is no longer with them. How can we get H4 status for her now? Will she be in protected period of stay once i join in H1B and how long can she stay in this status? Is it a black mark on her profile whenever she tries to re-apply her H1b petition? Your H1B status gets active as soon as the H1B COS is approved which means you are on H1B status now (from today). Your wife’s L2 status is NOW not valid as it was dependent on your L1 status. She is ‘Out of status’ at this time and should leave USA and get H4 stamped using your H1B approved i797. She has to be get H4 status to be your dependent and stay in USA. Without explicitly filing for her H4, she cannot automatically move to H4. Spending out of status time in USA is NOT recommended. You will have to explain the reason for this time in all your future visa applications. So, its better you take action quickly. Oh.. Can i not have my employer file H4 COS for my wife now? H4 COS can be filed if i94 is still valid. But, It is better that she gets h4 stamp from outside USA as H4 COS is currently taking more than a year to get approved! Ok Thanks for the advice. We are planning to go to Canada for H4 stamping in April 1st/2nd week. Hopefully that is ok.
You should be okay. Do share the result and your experience. All the best. Here is the H4 Stamping checklist if you want. Thanks Anil for your time and advice. One last question : will it be a problem if my wife’s ex-employer decides to withdraw her RFE’d H1b petition before our consulate interview? Will my wife’s stay in US become illegal then? We do not want any black marks or reason for denial, hence these many questions. Thanks again! As per the information shared by you, your wife is already ‘out of status’. She should leave USA as early as possible anyway. Each day is added to your ‘Out of status’ time in USA. H1B withdrawal does not make any difference at this point as per my knowledge. Even if H1B is approved, it will be approved with Consular processing. Thanks for your time and patience in your replies. I was in Canada last week for the stamping. H1 and H4 approved with no questions. We are back to US with all valid paper work. Thanks again. Great. Congratulations and thanks for sharing the result.